The Treasury has at long last unveiled its plan to steady the battered financial sector. Who can really tell whether it will be successful but the plan itself has been battered in short order – it’s only been a few days but no one could pay me enough to be Tim Geithner’s seat right now. After reading and re-reading a number of pro and con articles, I can only wish the man well not because his plan is a good one but because he is a human being in a Treasury department that is empty at the highest levels – like someone thrown in the lead car of a roller coaster that has left base station while everyone acknowledges that the tracks are not yet complete. What is a plan? I mean, Why engage in planning at all? Let’s just roll with the punches and end up wherever we end up. Actually, that’s what happens in the real world but planning gives you an advantage i.e you have a chance to press towards a goal knowing what footholds are available, some idea of the strengths you bring to the fight and where some of the weaknesses are. But for that you have to have planned beforehand i.e. mapped out a baseline, run through some scenarios and know some fallback options. So what is a plan? Among other incarnations, it is a map of how you intend to get to a goal. So what is the goal here- “the most important bar none short of selling your soul after a heart transplant” goal? To me, the goal is economic recovery. It is not saving the financial system or some or all players within it – they can save themselves. In so far as some of these financial players contribute to that economic recovery, we should be use them as crutches. It is not saving homeowners who took on crazy amounts of debt or those whose credit cards were means to an imaginary life or even survival. Or whatever else has already cracked or given way under this period of duress. The reason I say this is because even though we may not be able to comprehend it, this may only be the first wave with several more waves to follow the intensity of which we don’t know. Of course this depends on two things – an understanding of what else may give way and what we’ve already committed as actions through this first wave which may give us a foothold or may be a false floor. But in order for an economic recovery to be sustained, an intermediary financial market has to exist i.e. a functioning market that evaluates credit worthiness and supplies funding for requests from various participants. In my opinion, there are two activities that a plan should support in its archetype – dampen the implosion and prime a recovery. If you were to survey the entire gamut of activities that you’ve heard about so far, what would you conclude – is the implosion being dampened, is a recovery being primed or is it just a fall back on an economic ideology or something else that could be classified as confusion? Now, confusion is a part and parcel of a fluid environment but one ought to take a step back and be able to find a bearing despite the confusion. Are you able to locate one over and above the vapidity of change? Most of the efforts so far (before this plan) is heavily tilted towards dampening the implosion with next to nothing about priming for a recovery (well, I don’t think that economic recovery stimulus bill does anything here – all the future collectible taxes that have been allocated as stimulus will course through the patient like a jolt when it hits. I guess one can expect a few quarters of sunshine if that (to take a metaphor to the macabre ) but I don’t think that one would conclude that because the patient momentarily rose into the air, that he was trying to sit up). Momentarily, it seems as if the implosion has slowed as large sums of money are pumped into the system but as you will discover reading further, we are dampening the implosion from one cause i.e. residential mortgages. There are other causes which are namely credit card debt, commercial mortgage default and last of all the leveraged buyouts of various entities. So onto the plan. As you might have very well read before : Treasury proposes plan to purge “Toxic Assets”, the provided sample calculation should be sufficient to throw some light on the matter. Step 2: After conducting an analysis, the FDIC would determine that it would be willing to leverage the pool at a 6-to-1 debt-to-equity ratio. This is part of the problem that the Treasury claims it was trying to avoid. The raison d’etre of the plan is that by bringing in private investors and managers, the treasury would be able to avail itself of expertise in properly valuing these assets. However, by determining the leverage ratio ahead of time, the government through the FDIC has already set up an envelop for the price of the securities. This is no different than saying that it is the FDIC that is actually pricing these securities. Step 3: The pool would then be auctioned by the FDIC, with several private sector bidders submitting bids. The highest private bid – in this example, $84 million – would be the winner and would form a Public-Private Investment Fund to purchase the pool of mortgages. For a pool of residential mortgages at $100 million face value, is there going to be a private sector bid at $84 million when home prices on average have decreased 25-30%. Even with home prices decreasing 25-30%, one would hazard a guess that the areas where these residential mortgages are really distressed have seen greater price reductions. So in my opinion, if one changed the highest private bid in this example to $40 million (or less), one begins to approach reality. This would most likely result in banks not willing to sell the mortgages. The plan cannot go forward then. Step 4: Of this $84 million purchase price, the FDIC would provide guarantees for $72 million of financing, leaving $12 million of equity. If Step 2 and Step 3 are sound, then this follows. However, there is no reason to think that the previous steps are sound. Step 6: The private investor would then manage the servicing of the asset pool and the timing of its disposition using asset managers approved by and subject to FDIC oversight. Getting the private investor or independent asset managers to handle this is a good idea but this is an irrelevant positive. So as you might be able to see, the plan is problematic because it relies on the government ball parking the price of the securities (and through them the residential mortgages) The government does this in two steps: first through the leverage ratio and second by being very optimistic about the value of these mortgages such that the banks will be willing to sell them and private investors willing to partner with the government to buy them. The Obama administration is now completely wedded to the idea that there’s nothing fundamentally wrong with the financial system – that what we’re facing is the equivalent of a run on an essentially sound bank. As Tim Duy put it, there are no bad assets, only misunderstood assets. And if we get investors to understand that toxic waste is really, truly worth much more than anyone is willing to pay for it, all our problems will be solved. 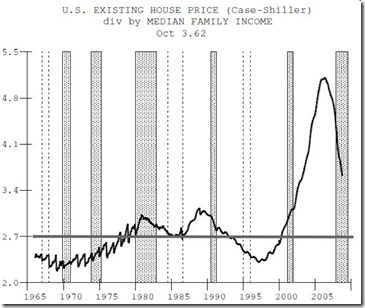 The above graph is simply a plot of Home prices divided by median family income for the United states over a little more than 4 decade period. Now, I am simple revert to the mean kind of guy unless there is some compelling reason to overshoot or undershoot. So do you see any compelling reason why we will not revert back to about 2.7 or even lower than that? 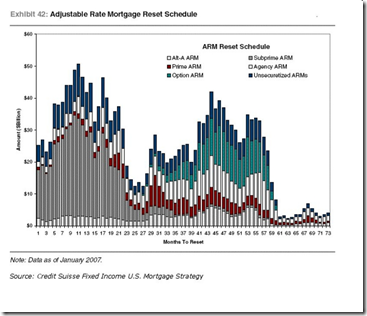 This is a graph dated from January 2007 that gives a timeline of the various mortgage types that will undergo a reset at some point in the future. As you can see, we have passed the period of Subprime ARMs being reset (as of January 2007) but look at what’s coming up ahead? This is the reason why I believe that we’re through the first wave and you also begin to see why it is one of the important reasons why I think that the Fed wants to keep mortgage rates low (failing which, we start to drive more and more people off the cliff with the resets to come). The outstanding issues that are yet to be considered are credit card debts, commercial real estate defaults and finally Leveraged Buyouts (LBOs) that were all the rage at the very end of this expansionary cycle. We’re beginning to see some of these issues surface here and there but I don’t think that we’ve seen the end of them.